Homespun Elegance: HELLO KITTY GIVEAWAY!! Since there are SO MANY of us Hello Kitty fans - I wanted to do a giveaway for some blog candi! 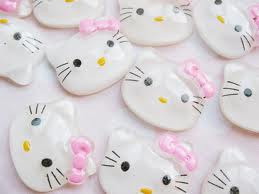 The winner will receive 20 Hello Kitty Resins similar to photo below! The winner will be selected by Random.org on Saturday, February 11th at 8 am! FYI - Make sure you come back this date - You will ALSO get to see the Valentines Day Social Come Together!! 1. Become a fan of www.homespunelegance.blogspot.com - if you are already a fantastic fan you are almost there!! and Shared to be entered with contact information! Thank you all for coming back and checking!! Winner will be announced Saturday Morning February 11th!! ALSO THANK YOU Fantabulous Cricut Challenge Blog!! I didn't win, but heck I am super excited to be chosen in TOP 5 :) Thanks girls!! To see my Photo frame (with my little man) that was made with the Imagine Lori's Garden Cart over at FCCB CLICK HERE!! These are so super adorable. i am a new follower of your blog and facebook page. I'm a fan, love your work and love Kitty!! I hope I win!! Soo cute! I love Hello Kitty! I <3 Hello Kitty... really, what girl doesn't?!? Awesome gift-away & have a great weekend. Wow I love anything that has Hello Kitty on it! I am already a follower and I just liked your Facebook page :) Thanks for the chance to win! Fan and Follower! Great Stuff! Awesome blog...and cute Hello Kitties! I "Like" your facebook page...This is really a great place to visit! Love Hello Kitty :D Shared on FB, Twitter.. Liked your facebook page as well. Thanks Tanya and Welcome!! Love having you!! Hi Shelly!! Need our get together for a crop night! I liked, followed, and shared! I'm a fan of anything Hello Kitty! I'm thinking they would make great centerpieces for hairbows. Thanks for the chance to win!